This week I received a surprise visit from a friend, her husband and child who were visiting for the day from Seattle. My friend came up to Vancouver in search of a poetry book by British poet Wendy Cope. If you are going to engender a love of reading in your child, I can’t think of a better way than to make an adventure out of finding a book. Do you ever read those articles about a successful woman who empties her handbag in order to reveal the contents to readers? In one such article I read recently a busy mum who works out of the home revealed that she has taken to reading poetry because she can still maintain her love of literature, yet doesn’t have to worry about losing her way in the plot of a book that she can’t read for long periods of time. If you happen to live in London, England, depending on where you are, poetry comes to you. Three times a year new poems are posted for the benefit of passengers on the transit system. The original project was started in 1986 by writer Judith Chernaik. A similar project has appeared on Vancouver buses, where every now and then you will see a poster highlighting the work of new poets. The archive of poems from the London project and the related books provide an interesting list of accessible poetry by new poets. 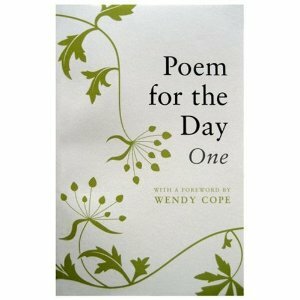 On a similar track, the book Poems For the Day One (with a forward by Wendy Cope) provides a year’s worth of poems for consideration. Poems aren’t just for English majors and the very young. Children of all ages and adults – like you – can enjoy poetry too. Obra Inversa set W. H. Auden’s “Stop All the Clocks” to music.